5:35 p.m., Nov. 14, 2006--Detective work and perseverance by Nina Athanassoglou-Kallmyer, UD professor of art history, have brought about the discovery of an important American painting--a copy of Theodore Géricault's 1819 masterpiece, Raft of the Medusa, by American artist George Cooke, done in Paris sometime between 1826 and 1830. American painters went to Europe to study and copy the old masters' works in Rome and Paris in the 18th and 19th centuries, Kallmyer said. These copies served a double purpose--they honed the skills and understanding of the artists themselves while copying famous paintings, and the copies introduced Americans to great works of art that would otherwise be unavailable in those times. What made Cooke's copy of the Raft of the Medusa unique was that he chose not an old master's painting, but a contemporary, hotly controversial, politicized painting as his subject. The Medusa, a French royal flagship was shipwrecked off the coast of Africa because of the incompetence of its captain, who received the appointment because he was a favorite of King Louis XVIII. Survivors spent two weeks on a makeshift raft, without food or drink, suffering from the heat during the day and cold at night, and resorted to cannibalism to stay alive. Their numbers dwindled from 150 to 14. American artist George Cooke’s copy of Géricault’s ‘Raft of the Medusa,’ painted in Paris sometime between 1826 and 1830, recently was found in the collection of the New York Historical Society. The wreck of the Medusa became the center of controversy in France between the royalists and antiroyalists, Kallmyer said. Géricault's huge, highly dramatic painting of the survivors on the raft hailing the British vessel Argosy, which rescued them, became a kind of lightning rod of opposing political forces. 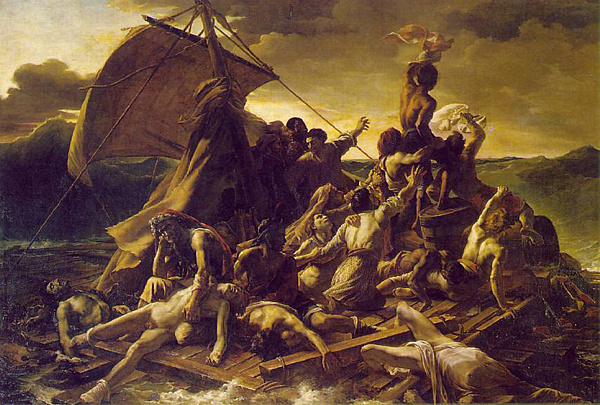 Americans were aware of the wreck of the Medusa and the controversy caused by Géricault's painting, and when Cooke brought his copy of the painting home in 1830, it took on a life of its own, Kallmyer said. 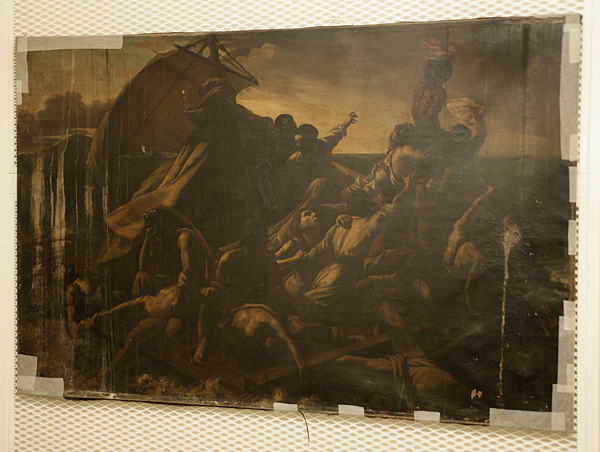 Although smaller than the original (4x6 feet as compared to 16x23 feet), it conveyed the drama of Géricault's painting and was shown in Boston, Philadelphia, New York and Washington, D.C., where it attracted crowds of viewers, Kallmyer said, and received a much better reception than in France. Much was written about it, including reviews praising the painting, poems, plays, light and sound shows and even a children's book. Eventually, the painting ended up as the property of Uriah Phillips Levy, a former American admiral turned prosperous New York real estate magnate, who bequeathed it to the New York Historical Society in 1862. It then vanished from public and private view. At some time in the past, the painting was mistakenly attributed to famous, early American artist Gilbert Stuart and consequently was not catalogued correctly. Almost 150 years later, enter Kallmyer, who was carrying out research on the original Raft of the Medusa and the copy by Cooke for an upcoming book on Géricault, which will be published by Phaidon Press in London. Her research indicated that Cooke's copy was held by the New-York Historical Society, but because of the early error, the society's cataloging system recorded no works by the artist. Curator Marybeth De Filippis, however, decided to try one last time to comb the historical society archives by description rather than by artist, and discovered the painting depicting the Medusa raft and contacted Kallmyer. When Kallmyer went to New York to see the painting, she knew her quest was successful and that this was the copy by Cooke she had sought for so long. “The painting was not in good condition and needed restoration work. It occurred to me that since this was such an important painting, it might provide a worthwhile project for UD's Department of Art Conservation,” Kallmyer said. 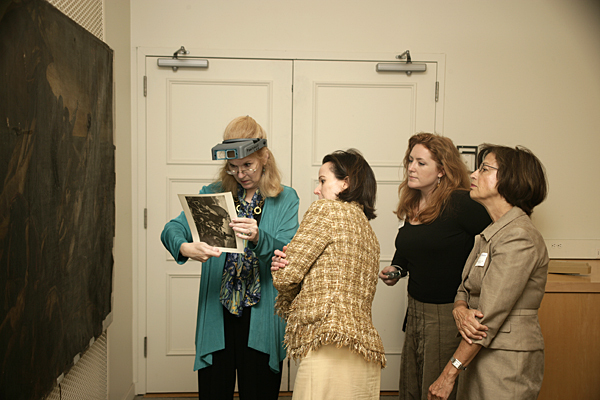 She talked to the staff of the historical society and then contacted Joyce Hill Stoner, professor of art conservation and director of the Preservation Studies Doctoral Program. Stoner, Kallmyer and art conservation graduate students Lauren Cox, Amber Kerr-Allison and Kristin de Ghetaldi traveled to New York to examine Cooke's painting and to meet with director Linda Ferber and De Fillippis. Examining Cooke’s copy of the ‘Raft of the Medusa’ are (from left) Joyce Hill Stoner, professor of art conservation and director of the Preservation Studies Doctoral Program at UD; Marybeth De Filippis, curator of the New York Historical Society; Amber Kerr-Allison, a UD art conservation grad student; and Nina Kallmyer, UD professor of art history. The painting had experienced some major and minor mishaps, according to Stoner, with a few small holes and tears and quite a few areas of lifting and flaking paint in addition to serious blanching which exposed the canvas below. Fortunately, she said, much of the damage was in the peripheral areas of the painting. After examining the painting in detail, Stoner made the decision that it could be restored, and that it was a worthwhile project for the Department of Art Conservation. “Everyone concerned was elated--it was a time for celebration,” Kallmyer recalled. After Thanksgiving, Cooke's copy of the Raft of the Medusa will head to Winterthur Museum and Country Estate where UD faculty and graduate students will examine it closely, make a plan on how to proceed and work to restore the painting to its former glory. Kallmyer is seeking detailed color photographs of the original painting from the Louvre, which will be very helpful as a comparative tool, Stoner said. Born in Athens, Kallmyer grew up in Europe and is a graduate of the Sorbonne. She received her doctorate from Princeton University and joined the UD faculty in 1982. Among her honors, she was named a Guggenheim Fellow, Visiting Senior Ailsa Mellon Bruce Fellow at the Center for Advanced Study in the Visual Arts at the National Gallery and Stanley Seeger Fellow at Princeton University. She is the author of Cézanne and Provence: The Painter in His Culture, Eugène Delacroix: Prints, Politics and Satire and French Images from the Greek War of Independence, 1821-1830: Art and Politics under the Restoration.